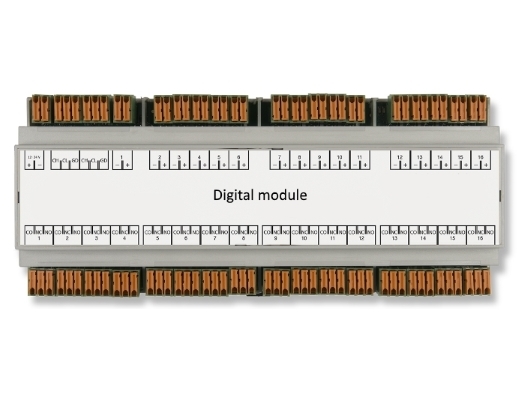 The module has 16 inputs and 16 outputs. Every input channel is optically isolated and completely independant of each other. Every output is a relay with a normally open, normally closed and common contact. The outputs can operate with a voltage of 24VDC or 75VAC maximum. The module has an internal ARM Cortex-M0 processor which runs at 48MHz. CAN-bus messages are processed quickly and there is room for custom application code if required. The device can for example react to messages from a temperature or analog module.